Thursday, January 24th, 2019 was a chilly day in Houston, but our hearts were warmed by all the smiles at For A Day's first event of 2019. This event was at MD Anderson, where eight girls and seven boys enjoyed a morning of food, fun, and entertainment. 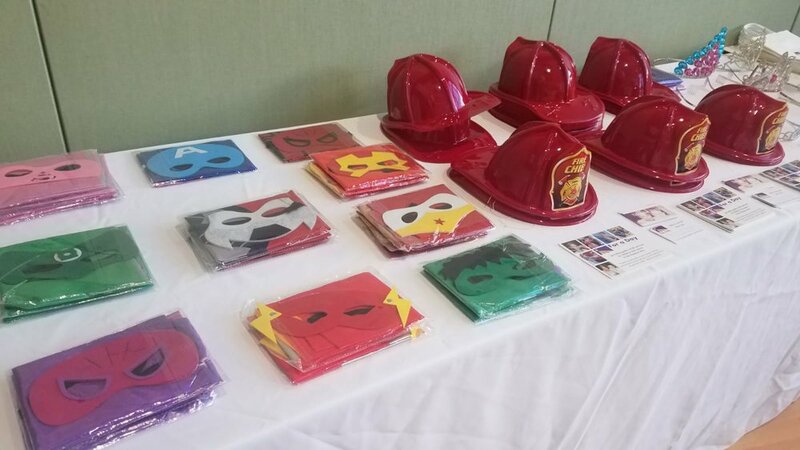 Everyone, along with their siblings, got to pick their own firefighter hat, glittery tiara, or a cool superhero cape and matching mask. The boys and girls were excited about our three tables of craft activities. We had an activity where the children put pieces of a firetruck together; we had coloring pages, and a doorknob hanger craft, and fire department sun catchers. It was wonderful to see the children working hard on their crafts. Besides letting them express their personalities and creativity, the activities also gave the children and their siblings a terrific bonding experience; the teenage sister of one of the little boys came to the event so that they could do the activities together. I also participated in the activities and, among the children that morning was a girl I had seen at one of our previous events. I sat down with her to do the activity she was working on. She has the sweetest, most beautiful smile. It is the kind of smile that gives me joy to this day, the kind of smile that pushes me to do better and do more for her and every one of these brave children. As the children were engaged in the activities, helpful volunteers took instant photographs which were then given to the families to take home. Volunteers also gave the girls princess makeovers and princess manicures. For refreshments, wholesome goody bags with juice boxes, chips, and other little nibbles were provided for the children and their families. After we finished the craft activities, the children and their families were treated to an amazing show by the members of Harvard Glee Club. We at For A Day want to thank all our volunteers, sponsors, and donors for helping to make our first event of 2019 an enormous success! Without you, none of this would be possible.